Recently, I had the occasion to talk about Iran’s nuclear project with a former senior military officer. His initial comment to me brought me up short. “Why does the world care about whether Iran gets the Bomb? Are you telling me that they are as crazy as the North Koreans?” To which I replied, “Yes.” That appeared to jar him. He replied, “then that’s frightening.” If that is any indication then the media and the Obama White House have failed to inform America of how dangerous the Islamic regime’s possession of nuclear weapons is. This is a clear and present danger to Israel, America, the West and Iran’s own people. All the news about US and EU economic sanctions, failed UN negotiations, IAEA and US national intelligence estimates have warned that Iran has accelerated uranium enrichment to weapons-grade levels. Israel is allegedly making preparations for a possible unilateral attack on Iran’s nuclear facilities. What is behind the Ayatollahs’ pursuit of this threat to the world? 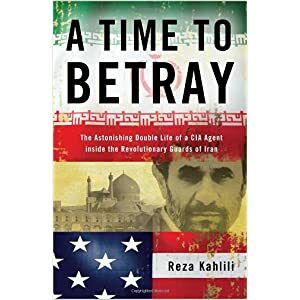 During our involvement with the recent Electronic Armageddon program of the Task Force on National and Homeland Security, we were fortunate to have made the acquaintance of ex-CIA agent, the pseudonymous Reza Kahlili, author of the award winning book, A Time to Betray: the Astonishing Double Life of a CIA Agent inside the Revolutionary Guards of Iran. A Time to Betray made Washington Post’s Book World Bestsellers list in 2012. It was a winner of The 2011 International Book Awards in two categories of: Autobiography/Memoirs and Best New Non-Fiction and Winner of The National Best Books 2010 Awards (category: Non-Fiction: Narrative). Kahlili had firsthand knowledge of the Shiite Mahdist doctrine that propelled the Islamic revolution of 1979. He obtained information on the 35 year effort by the Islamic Republic to acquire and build nuclear weapons threatening an Islamic takeover of the Middle East and ultimately the world. In a wide ranging interview Kahlili discusses his idyllic upper middle class background that could afford his education in the US and how Iran went from being a largely secular country under the late Shah to become an Islamic theocracy that returned the country to medieval tyranny under Shiite Mahdism. A tyranny that saw women put behind the hijab, tortured, raped and murdered and hundreds of the Iranian Army leaders summarily executed at the notorious Evin prison in Tehran. A tyranny that saw donkey riding Islamic clerics living off meager contributions and handouts rise to become dictators suppressing Iranians, controlling the nation’s economy and threatening the world with nuclear, chemical and biological weapons. Not many Iranian patriots would, as Kahlili did, on a trip to visit an ailing aunt in Los Angeles, reach out to US intelligence to apprize them of the horrors and dangers of the Islamic Republic under founder Ayatollah Khomeini and the Revolutionary Guards. He was compelled to do so after witnessing tortures and executions of innocent fellow Iranians. That encounter in the US led to his recruitment, training in Europe by the CIA and return to Tehran to become an undercover member of the Revolutionary Guards. He secretly informed his handlers on the international and domestic terrorist programs of Iran’s Supreme Leader, Council of Guardians, Revolutionary Guards and its Qod Force. The invaluable information and professional assessment of the personalities and agenda of the Islamic Republic obtained by Kahlili enabled the CIA to maintain a watching brief on the funding, training and arming of terrorist proxies Hezbollah and Islamic Jihad and nuclear and missile delivery programs secretly launched by order of Ayatollah Khomeini. After spending several years in the 1980’s and 1990’s undercover as a Revolutionary Guard officer, and CIA asset, Kahlili was able to extract both he and his family to Europe and exit to safety in America despite the fact that Kahlili has been a lecturer with the Department of Defense’s Joint Counter-Intelligence Training Academy. A convert to Christianity, Kahlili has recently been attacked in letters sent to Secretary of Defense Panetta by CAIR, for his criticism of Shiite Islamic Doctrine. Fortunately, his valued experiences and insights into Iran’s state sponsorship of terrorism globally are reflected in the support he has received from both senior military and Congressional leaders. His commentary and analysis are frequently published in the Washington Times and The Daily Caller. He has been interviewed about his undercover experience and informative views of the Islamic Republic’s leaders. Watch this November 2010 interview with Erick Stakelbeck, CBN’s premier terrorism analyst. What follows is a portion of our interview with Reza Kahlili providing insights into the overarching Mahdist doctrine of the Islamic regime’s Supreme Leader and others. The dangers of Iran’s nuclear and WMD programs to Israel and America support and funding of terrorist proxies in the Middle East, Latin America and even cells in America are discussed. Kahlili reveals the deepening hatred of many of Iran’s people to both the regime and its Shiite Mahdist doctrine seeking to create worldwide chaos to foster the re-appearance of 12th Imam Mahdi. Iran’s Supreme Leader under this doctrine would hand the flag to Imam Mahdi to lead the conquest and conversion of the world’s infidels to Islam. Kahlili also speaks about the repercussions of any Israeli pre-emptive attack and the necessity for the US and the West to support regime change in his native Iran. Regime change is earnestly desired by many people in Iran who despise its rulers and Islamic doctrine for their lack of basic freedoms and reduced economic status. Surprisingly as we have found from recent debriefings of travelers to Iran, many people still harbor respect for America and Israel, notwithstanding the failure of the Obama Administration to come to their aid during the uprisings following the June 2009 fraudulent Presidential elections. You may listen to the entire interview with Kahlili, here. Jerry Gordon: Reza Kahlili, thank you for taking time out for this timely interview. Reza Kahlili: Thank you for inviting me. Gordon: You have written extensively on the Mahdist Twelver Islamic doctrine of Iran’s form of Shiism. Could you tell us what that doctrine is and how it guides the actions of the Supreme Leader, the President and his cabinet and leadership of the Revolutionary Guard Corps? Kahlili: You see this is embedded within the philosophy on which they act. The Shiites believe that in the end of time Imam Mahdi, the 12th Imam, will reappear and kill all the infidels and raise the flag of Islam in all four corners of the world. This is taught by the clerics, they believe in it and they promote this ideology because in their eyes it's the ultimate justification where Islam conquers the world and everybody is a Muslim. In every conversation they have, their statements, their actions are representative of that ideology. The majority of the Iranians don't believe in this. They don't even see themselves as Muslims. They see themselves as Persians. Even if they respected Islam before the revolution due to cultural customs, now they openly despise Islam. Despise the religion. Despise the clerics and what they said within the Iranian community now cannot be said in America and Europe. There would be ramifications if somebody talked about Islam the way the Iranian people do inside. So we are talking about the minority who are the true believers in Islam and take everything literally from the Quran and martyrdom is welcomed with open arms. They believe that the Islamic regime was put in place by Allah and that the end of days are at hand and their studies of the Hadiths, which are centuries old sayings by prophet Mohammed and his descendants, are representative of what is going to taking shape in the world. They are very excited with what's happening in the Middle East because they believe these are signs spoken of centuries ago that the end of times is near. The triggers are needed to create that environment for Imam Mahdi to come. Destroying Israel would automatically trigger the coming per the Hadith and in their mind create chaos, havoc, lawlessness, where wars take place. One third of the world population would die due to wars, another third to hunger and the rest live in lawlessness. This theology drives their actions and policies. That is what I've been trying to raise awareness among the public. This is serious. You have to look at the Haghani school and other seminaries in the city of Qom which the founder Ayatollah Mesbah Yazdi and the Ayatollah Jannati, the powerful chairman of the Guardian Council have established, they promote this idea. Every minister of intelligence has been associated with the Haghani School and they control almost all of the security institutions in the Iranian government. This is a dangerous element that believes they have a mission to create the environment for the coming of the Imam Mahdi. Ayatollah Khomeini, the founder of the Islamic Revolution said it himself. He had three goals for the revolution. One was to topple the Shah and the Monarchy, two was to establish an Islamic state and three was to pass the flag of Islam to Imam Mahdi. It was said that within the circles of the top officials in Iran that Ayatollah Khamenei is the one who is going to pass the flag of Islam to Imam Mahdi so they truly believe in this. Gordon: What are the relations between the Supreme Leader Ayatollah Khamenei, the Revolutionary Guard, its Qod Force and the Basij and their respective roles in the Islamic Republic's Domestic and External Terrorism Programs? Kahlili: The Revolutionary Guards and the Basij and all of the military and security forces are under the control of the Supreme Leader's office. There cannot be any action done without the approval of the Supreme Leader. The Supreme Leader has the authority to change any commander at any time as Khamenei has done several times. The Revolutionary Guards though, have great influence in the Iranian economy, a big military force in Iran and have an international operation. Yet, they are under the control of the Supreme Leader and the Supreme Leader can change commanders at any time. There is a unit within the Revolutionary Guards called Hefazat Etellaat, protection of intelligence. The commander of that unit is chosen by the Supreme Leader and reports directly to his office. The unit acts independent of the Guards command like the SS within the Nazis. This unit is present in every base, in every building and they report directly to the Supreme Leader's office. Their intention is to have tight control, even over the Revolutionary Guards. I would say every act in Iran right now is an act that has been approved by the Supreme Leader and his office. Even the media outlets. Not a word can be printed without the approval of the security forces. Gordon: Could you describe for us the range of external activities of the Qod Force in conducting covert operations in the Middle East and globally? Kahlili: The Qod Force’s major operation is to collaborate with terrorist proxies, arm them, transfer explosives, cash, and fund them. They run a drug program and counterfeiting operation. They export drugs to create increased unaccounted funds for the Qod Force’s activities and counterfeiting to destabilize the Western countries by printing and circulating U.S. bonds and dollars. Now they have a grand project called, "Time for the Collapse" in which according to this plan they intend to destabilize the West through their terrorist campaign, money laundering and drug trafficking. They have many connections in Europe, Latin America and Africa and other areas where they collaborate with Hezbollah and drug cartels. The collaboration with drug cartels is directed at gaining greater access via infiltration such as is happening in Mexico and from there into the U.S. They have a very complex operation at the center of which is terrorism and destabilization of the West. They have many cells along with Hezbollah here in the U.S. who are ready to commit terrorist acts should there be a confrontation between U.S. and Iran. They also collaborate with many other governments including Venezuela and have established numerous entities in that country. These are front companies that host explosive labs and terror cells. From Venezuela they expand into Latin America, Mexico and the U.S.
Gordon: Given that the Qod Force has fought a 30 year terrorist war with Israel's Mossad, what anti-Semitic doctrine motivates the Islamic Republic to conduct covert ops and what resources and proxies have been used? Kahlili: I think the central delusion of Western leaders is that they refuse to understand the ideology behind the actions of the Islamic regime. Basically the ideology of the radicals in Iran is to stand against every principle of Western society. The Qod Forces are an element of that radical minority which runs Iran. It is truly committed to its goal of destroying Israel, destroying America and basically creating an environment for the re-appearance of the Imam Mahdi. He will lead them to kill the rest of the infidels and raise the flag of Islam in all four corners of the world. They truly believe in this and that's why they are so committed. I think that is what the West refuses to understand and it is going to be our downfall. I published several months ago in November 2011 an analysis by the Qod Forces clearly outlining their philosophy. It said the problem facing Americans regarding the Qod Force is but a small example of the core of their problem with the entire Islamic Revolution. The most important fact that America and the West have continuously missed is the ideology behind Iran's destiny. Its doctrine knows no boundaries and it stands in diametric opposition to the most basic principles and fundamental forms of Western civilization. They are saying to the West that their ideology is in opposition to basic principles of the Western civilization and you can't change that. There is nothing you can do to bring about a change of behavior and therefore the failure of the approach that every U.S. Administration has taken. They don't understand that this ideology stands against the West. You cannot change that because if you were able to change that then that ideology no longer exists and that can't happen. Gordon: Why has the Islamic Republic pursued the development of nuclear weapons and the means of delivery including wide ranging missiles and what third parties assisted them? Kahlili: From early on the Soviet Union and then Russia was deeply involved with this regime helping the Guards with their intelligence operators to consolidate power for the clerics. Then the Chinese got involved and they helped with the missile program and even the nuclear program by bringing the Islamic regime and North Korea together which continues the collaboration to this day. The Chinese are helping the Islamic regime with the inter-continental ballistic missile technology that the regime will test very soon. They are sharing data on the nuclear detonations that North Korea conducted. Even that action is being financed by the Islamic Regime. The regime started this project for a nuclear bomb in the mid 1980's. This is a fact and nobody is talking about it. We had intelligence that Iraq's Saddam Hussein was looking to purchase actual bombs and he had approached the black market through Pakistan and others. The story was that the chief commander of the Guards asked permission from Ayatollah Khomeini, the founder of the Islamic Revolution, to authorize acquiring the nuclear bomb and it was authorized. A document to this effect surfaced many years ago within Iran and then it disappeared, however, there was an actual authorization by Ayatollah Khomeini for the nuclear bomb. At that time the Guards approached the Pakistanis with billions of dollars to buy a bomb. They ended up with centrifuges instead and help from A.Q. Khan with the program. After the fall of the Soviet Union they approached the former Soviet Republics to purchase bombs. The news is they have two nuclear bombs however; there is no confirmation that they have the codes. People here in the U.S. believe that they do but a source within the intelligence unit of the Guards indicated that he is not positive. Recently I published an article saying that the Guards had distributed WMD's to terrorist groups such as Hezbollah, Islamic Jihad. These are chemical and biological weapons. The article was based on a Revolutionary Guards’ statement within its own organization media outlet. They confirmed that a nuclear bomb was acquired from the former Soviet Republics and that this program has been going on for decades. They currently have enough enriched uranium to produce six nuclear bombs. They are enriching uranium at two facilities that we know of. The intention is once the missiles are armed with nuclear warheads they become untouchable. A single nuclear detonation in the Persian Gulf would stop the oil flow from the Persian Gulf because of contamination. It could take years before a drop of oil could be exported. Thus the world could be taken hostage because the global economy could collapse if such an incident takes place. Their strategy is to attack Israel through proxies, further infiltrate European and American society, commit terrorist acts, and hostage taking, and expand power in the Middle East confronting Saudi Arabia by creating instability in Bahrain, and helping the Muslim Brotherhood in Egypt. Khamenei has recently said that there were events transpiring right now that will affect the political and social environment of the world for good and Islam is the leader of the pact. That is just the bare minimum. I believe that because of their belief in the end of times and that the time is close at hand for Imam Mahdi to re-appear, they will get the bomb. They will use the bomb. They will destroy Israel. They will collapse the global economy. There will be major wars and we'll see one of the greatest depressions humanity has ever seen. They believe at that time the Shiite 12th Imam will reappear and conquer the world. Gordon: What is the decision making process within the Islamic Republic for launch of weapons of mass destruction against Israel and the United States? Kahlili: You have to look deeply into the mind and ideology of Hassan Rahimpour Azghodi and other of Ayatollah Khomeini’s closest advisors. The Supreme Leader and figures such as Mesbah Yazdi and Janniti believe they are mandated to create an environment for the coming of Imam Mahdi. They believe one or two nuclear weapons launched against Israel would destroy Israel. There would be retaliation and millions of Iranians would die, innocent Iranians who oppose this regime and then there would be chaos throughout the world. There would be missile launches against Saudi Arabia and European capitals. They think at that time Imam Mahdi would return. This appears to Westerners who have lived with logic and the consequences of the bad behavior, not to make sense. We all automatically refute this and believe that nobody is that crazy. However, they are. One reason for it is why not give up the program? Why not collaborate with the West? Why not have the sanctions removed and have better ties with the West? You know if you just want to gain power. If you want to hold power, why not provide for the people and you will have power, unlimited power and nobody is threatening to attack anymore. Why hold on to this nuclear program at all costs? They have shown that they are not logical people by Western standards. They are not rational people as some U.S. officials have suggested. If you look at it even from a Western point of view, Iran having the nuclear bomb would automatically create chaos. There would be proliferation, there would be confrontation, and they would become untouchable. The Persian Gulf is going to become a destabilized region. Oil prices are going to go up automatically with every word said. Israel doesn't know if there is going to be a launch one day or the next. That cannot be allowed. The statement that if Iran has the nuclear bomb then Saudi Arabia and others would want it is simplistic. Look at Pakistan having nuclear bombs. We have to spend billions of dollars to bribe them in order to protect those nuclear bombs. We are worried about that and yet we have the Pakistani government as an ally. Now the Islamic regime is an enemy not only to the Iranian people but to Israel, the US and the West. The Iranians having the nuclear bomb would unhinge the region and the world. Gordon: You have cited information on existing neutron electromagnetic weapons in the possession of the Islamic Republic that might be used in a possible electronic magnetic pulse or EMP attack on the U.S. and Israel. What is the nature of that threat and does Iran have the capability of launching such an attack? Kahlili: I received this information from an intelligence officer within the Guards who recently defected to a country in Europe. I passed that intelligence on to U.S. authorities and published it publicly. They have several neutron bombs. Now we know for a fact that North Korea has these super EMP bombs which are neutron bombs. The source told me that in a meeting of the security officials of the Guards a plan was discussed where they would detonate these neutron bombs in the atmosphere. We know that they have successfully launched ballistic missiles off of a ship in the Caspian Sea, detonating the warhead in the atmosphere. The IAEA has confirmed such activity which is in line with an EMP threat, Electromagnetic Pulse attack. I also revealed that many of the Iranian vessels have been armed with long range ballistic missiles. This could be a commercial vessel under a third party flag with containers carrying a ballistic missile. A ballistic missile could be launched in less than 60 seconds. They are expanding this mission to the Atlantic Ocean and the Gulf of Mexico using a scenario involving a commercial vessel enroute to Venezuela, Cuba, or Nicaragua. They could launch a successful Electromagnetic Pulse Attack on the U.S. Studies have been done for Congress showing that the devastation from a successful Electromagnetic Pulse attack on U.S. would be immediate. The U.S. could be sent back to the 18th century because our power grid is not protected. Telecommunication, water supplies and food distribution would be disrupted. Within weeks the study pointed out that Americans would be scavenging for food and water. One year after such an attack, two thirds of U.S. population could cease to exist. The Iranians have practiced a possible EMP ship borne attack. Arming their ballistic missiles with neutron bombs they could launch an Electromagnetic Pulse Attack on any country. Gordon: Recently you cited sources in IRGC Publications indicating that Iran has transferred WMD to terrorist groups Hezbollah and Hamas. Could you tell us what that WMD consists of and is that an escalation of threat to Israel? Kahlili: It is definitely an escalation. Iran has warned about the situation in Syria and made it clear that they cannot afford Assad to be overthrown. They will not allow it and a possible joint war effort looms coordinated by the Islamic Regime in Iran, Syria and Hezbollah. They would attack as a united front against the opposition. What is alarming is they are saying clearly that chemical, biological and nuclear bombs, weapons of mass destruction, could be used against Israel and those involved with the unraveling in Syria. They are blaming it on Israel and so they have said that armed groups have been equipped with such weapons. Once the order is given such weapons could be used against Tel Aviv. They have also talked about nuclear bombs acquired from the former Soviet Republics. This is verification on the information I put out last year about Iran having purchased nuclear bombs after the fall of the Soviet Union from the former Republics, this is a serious threat. We know that the Islamic Regime has a vast stockpile of chemical weapons. They mastered that during the Iran - Iraq war because Saddam was using these weapons against the Iranian Forces. We know Syria has a huge stockpile of chemical weapons and now we have the verification that those chemical and biological weapons have been transferred to Hezbollah and Islamic Jihad. Sheik Hassan Nasrallah, the leader of Hezbollah, said recently that they have weapons and that tens of thousands of Israelis would die. Now we are dealing with weapons of mass destruction with terrorist groups and the seriousness of the threat of the Islamic Regime building nuclear bombs. They will not hesitate to develop and use dirty bombs. Somehow they will transfer them to Hezbollah to equip smaller missiles or suitcase bombs. That is why the proliferation and consequences would create chaos and uncertainty destabilizing the world. We are living in very sensitive times and I think we need to take these threats seriously. We are dealing with chemical and biological weapons and have further concerns because we know they have cells in the U.S. I have passed some of this information to U.S. authorities. Gordon: There have been extensive reports of the Qod Force and Hezbollah cells in the Western hemisphere. Should this be of concern to both Latin America and North America? Kahlili: Yes. Many countries in Latin America are being infiltrated by agents of the Islamic regime with money and oil. Venezuela is a major hub for them. They have agents in Nicaragua, Ecuador, and Bolivia. They are arming and training cadres. The regime is using front companies based in these Latin American countries with the goal of helping to build homes, roads and infrastructure. These front companies have approached not only the Islamic community in these Latin American countries but also impoverished indigenous populations. Many Latin American countries are in a dire financial situation. The front companies recruit local assets, send them back to Iran for training, bring them back and give them a mission. In my book, A Time to Betray, I reported on the lawless triangle where Argentina, Brazil and Paraguay meet. There is virtually no police presence there thus the zone enables Iran to infiltrate, transfer arms and provide cash to recruit terrorists. They are currently sending cells to Paraguay, Guatemala, Nicaragua, Ecuador and Bolivia. This is a threat to the Western hemisphere. Gordon: Sanctions and diplomacy have not forced the Islamic Republic to halt their Nuclear Development Program. Israel appears poised to launch a possible unilateral attack on Iran's nuclear facilities. What is your view on that possibility, the involvement of Iran's proxies Hezbollah and Hamas and the likely affects on the people of Iran and what alternative actions might achieve the same end? Kahlili: When President Obama took office I wrote an open letter to him reminding the new President that negotiations and even sanctions will not work; we learned that the hard way. When President Obama took office Iran had barely enough enriched uranium for one nuclear bomb. Today they have enough for over six. They have enriched to the 20 percent level which is 80 percent of the way to weaponization where before they were limited to the 3-1/2 percent level. They have even indicated that they are going to enrich to higher levels reaching closer to weaponization. By appeasing the Islamic Regime we turned our back on the Iranian people's aspirations. We had a golden opportunity in 2009 to help the Iranian people to overthrow this regime. This regime could have collapsed within weeks. Internal intelligence reports later showed that had the demonstrations continued for several more weeks the regime could have collapsed. We now find ourselves in a confrontation that could create a major war in the Middle East. They are threatening Israel, they are arming Hezbollah, Islamic jihad, and they are expanding into Latin America with immunity. We have a very dangerous situation on our hands. We can help unify Iranian people, provide satellite internet proxy software for them to communicate with the outside world without the fear of suppression. We can provide satellite phones. We can help form a national council in U.S., to represent the Iranian people and provide a voice for the opposition to unite. All of this talk about the Islamic regime being a strong and united power and what they are going to do is really a bluff. The government has so many cracks within it. We have to take advantage of that. This government could collapse and we could save humanity, prosperity and world peace by helping the Iranian people to overthrow this regime. War alone will not do it. At most we may hit some sites that we know of. If Israel does it alone there will be huge repercussions. There would be hundreds of missiles launched against Israel from all sides. The Persian Gulf would become unstable. Oil prices would immediately go up and Afghanistan would be destabilized. In Iraq there would be a lot of things going on. In Egypt, the Israeli attack on Iran would help Muslim Brotherhood to strengthen their power and confront Israel. Overall there will be a huge unraveling in the Middle East which could affect world peace and the global economy. We should immediately take action to help the Iranian people to voice their resentment against the regime. Demonstrate to the Iranian people that we do not want to negotiate with Islamic regime. For starters, let's not allow Iranian President Ahmadinejad to come to New York for the U.N. General Assembly meetings in September. Why would we allow that for a national leader who openly calls for the annihilation of another state, Israel? President Obama needs to come out openly, criticize the leaders of the Islamic regime and say this is not tolerable. Let us send some strong signals to the Iranian people, to the Iranian Army, the body of which is supportive of Iran, of Persia. They have been looking for an opportunity to take revenge on this brutal regime that killed hundreds of officers after the revolution. These are actions that we can take to bring about change within Iran. Gordon: The U.S. government from Carter to Bush and now Obama has been complicit in not recognizing the theocratic oppression of Iran's people. You and other Iranian expats told us that Iranians not only hate the regime but Islamic doctrine. What in your view should our government do to foster civil opposition and regime change in Iran? Kahlili: It is very true that the majority of the Iranians hate this regime and the ideology it promotes. Every day the Iranians are exchanging text messages and videos and other forms of media mocking the regime, their leaders, their ideology and what they say. Many are converting to Christianity. The intelligence unit of the Guards is suppressing the converts; intimidating, torturing and now Khamenei ordered tens of thousands of Bibles to be burned because it was deemed not a holy book. What we need to do is provide technology to the Iranian people, foster leadership and they will unite. Right now the Iranian people feel that they are leaderless. They have no direction. You see pockets of demonstrations here and there; however, the vast majority of the people despise this regime. Many despise the religion but have no leadership. After the 2009 fraudulent elections they found the opportunity to come together in opposition to Islamic regime. The West turned its back on them. We need to put together an initiative. One example is beaming a High Definition radio program into Iran that every street, house, cab driver, bus driver will pick up. We can help with providing internet servers, satellites links that the Iranians could immediately access without being tracked. We could provide satellite phones; help with a temporary council to represent them here in the U.S to put everything in place. I have sent this proposal to some in the Congress. Even private entities who are interested in the global economy and world peace could help bring change in Iran. We have people who can put together a plan with intelligence on the Islamic government's operations, their weaknesses, their entities, and an exact plan where we will know what to do. It seems that nobody is listening especially with the elections coming up. Nobody is focused on this one issue that could unravel the world. Gordon: Reza, I want to thank you for this important interview. You have presented a challenge to America and the West to wake up and understand what warriors like you and others have told us time and time again about dangerous doctrine of the Islamic regime in Tehran. That we must invest in regime change, support the uprising and freedom of Iranian people. There is an expression in Hebrew, Kol Hakavod, which means outstanding that describes your courage in exposing this frightening tyranny of the Islamic regime. I would hope that if America and its ally Israel adopted and implemented your plan that you might become the leading voice of liberation for your fellow Iranians. Kahlili: Thank you so much for having me. God bless America and God bless you. Also see Jerry Gordon's collection of interviews, The West Speaks. To comment on this interview, please click here. To help New English Review continue to publish timely and interesting interviews like this one, please click here. If you have enjoyed this article and want to read more by Jerry Gordon, please click here. Jerry Gordon is a also regular contributor to our community blog. To read his entries, please click here.